Sami Jewelery: Men, manly men! Pewter bracelets are of course not just for women, actually most designs can be worn by both sexes, however when I made a bracelet for my dear fiance, I went out of my way to create an as manly design as possible, and this is the end result. 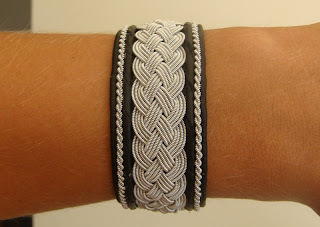 A 3 cm broad black leather bracelet with a 5 strand braid with 4 threads in each strand, it's really heavy! Manly no?